I have a new-found love for beets; I can't even remember why I didn't care for them in my younger years. They are sweet and flavorful and versatile! With one lone beet in my fridge, a bit of ground turkey and some cheese, dinner was going to be another home addition of Chopped. It's the show where chefs are given three ingredients and have 30 minutes to turn them into something wonderful. Luckily I had no real time limit. This mix worked quite well, I'm actually quite happy with the beet and turkey stuffing, and the tomato topping separately. 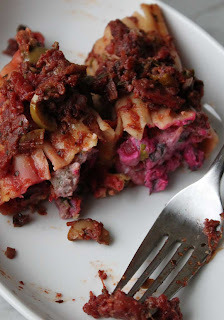 However, when I make this again, I do plan on creating a smooth, creamy beet sauce rather than the chunky tomato. 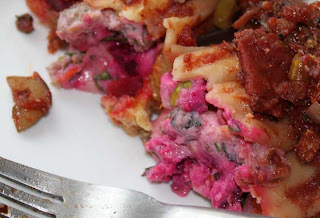 I had left over beet filling, so had it just warmed with a piece of bread for lunch the next day- it was wonderful! The tomato sauce as is, is super good and hearty and would make any pasta fat and happy! Let that simmer together about 20 minutes. In the meantime, cook about 8 manicotti shells according to package directions- but do try to leave them al dente since they will cook in the oven for a few minutes. Cool. Carefully stuff the shellls with the beet and turkey mixture. Lay each shell in a glass baking dish, cover with the sauce. Bake in an oven (375 degree) for about 30 minutes to reward the beet mixture. Enjoy! This sounds wonderful! I'm going to make it tomorrow but I have leftover turkey breast from thanksgiving so I'll just dice it.